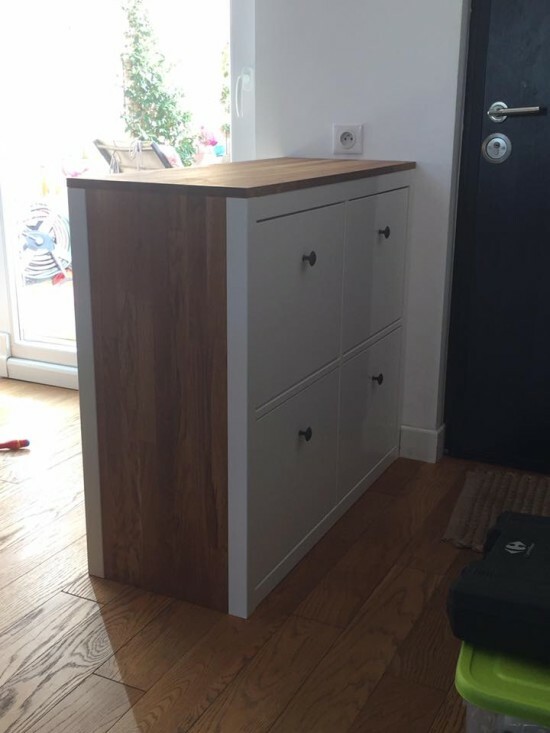 IKEA Hemnes shoe cabinet is a plain piece of furniture for storing: it helps you organize your shoes and saves floor space at the same time. You will have room for plenty of shoes as each compartment has double rows. There are several different options available and all of them are rather boring, so it’s high time to hack them all! 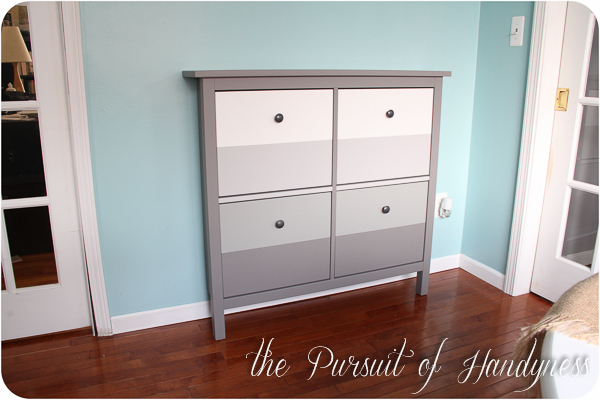 This is a simple and cute IKEA Hemnes shoe cabinet hack done in three colors, black-brown, gray-brown and white. The project is simple and basic: you reassemble the cabinet, then add masking tape where need and paint it in the colors you like. Add legs as stated and some knobs you like – the same as before or something different. Enjoy! 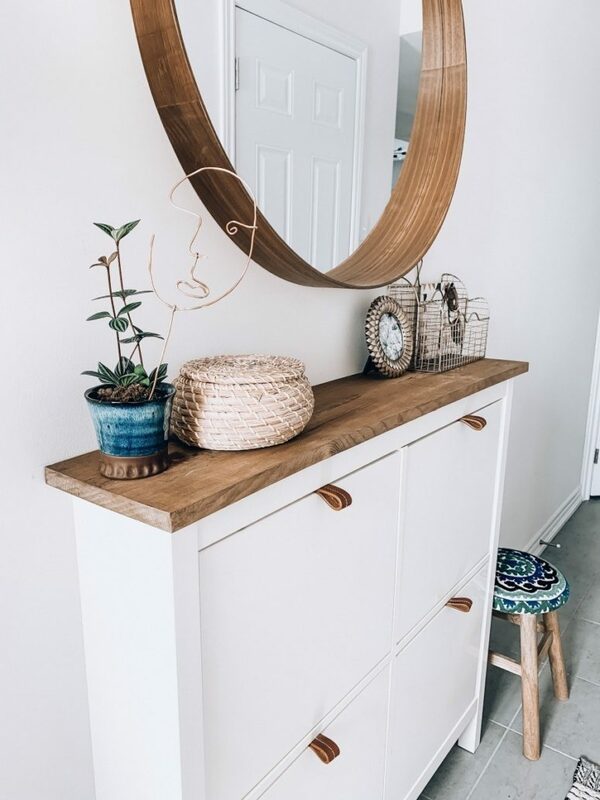 This IKEA Hemnes hack is a boho one, which is a hot trend right now. The authors replaced the top board of the cabinet with a stained pine board to tie it in with the other wooden elements in the entryway. Plus it made it more of a homey and welcoming space with some modern bohemian vibes. Fill your cabinet and style your space to your heart’s content! Here the authors added the Ikea round mirror, a runner, some hooks, and a small stool. What a great look! This Ikea Hemnes 4 compartment shoe cabinet comes in dark brown or black, white and natural wood. Turn it into a stylish shoe cabinet in navy, with a marble contact paper countertop and elegant brass knobs. This project should only take one weekend, completing within two days and under $200 total. Enjoy the look with a touch of edge – marble is extremely trendy right now. 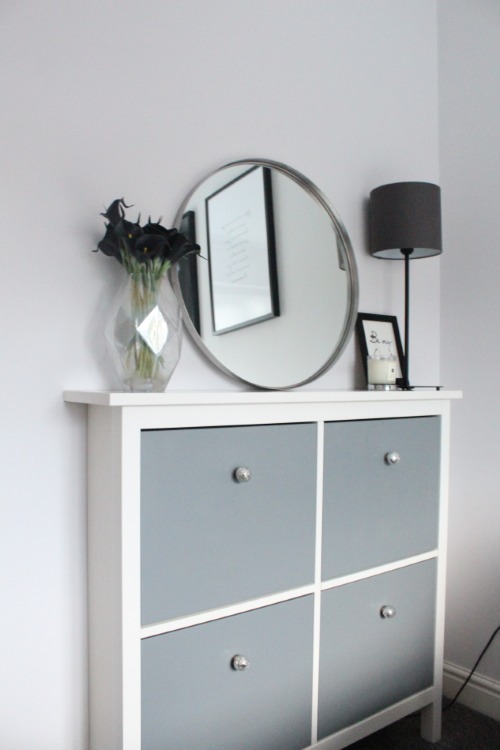 A boring Ikea Hemnes cabinet can be converted into an elegant and stylish piece with a touch of vintage. This project will tell you how to paint the drawer fronts with a grey paint leaving a wide white frame and adding little and cute knobs. The final piece is a very chic one, I love the color combo, and you? Keep in mind that if you don’t like grey, any other color will match, too! If you’ve never considered how versatile these IKEA shoe cabinets can be, this project will show that to you! The plan for this hack was to give it a faux built-in look and add hallway storage. The final piece is a white Hemnes cabinet with a stained tabletop and dark modern knobs, which features a very chic and cool modern look. 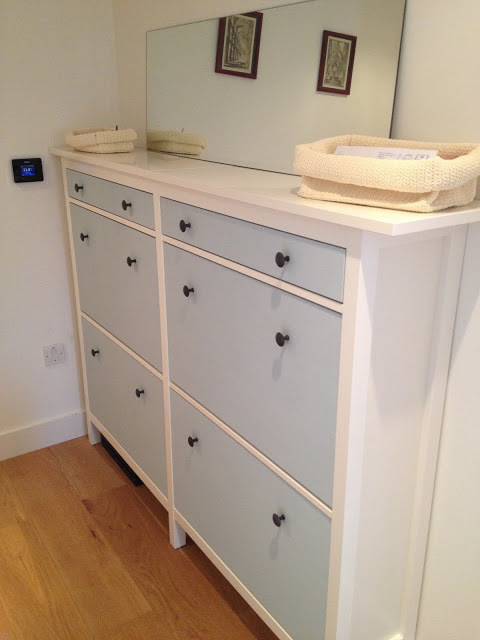 Here’s another super easy hack of an IKEA Hemnes shoe cabinet, and this time it’s a double piece in light blue. 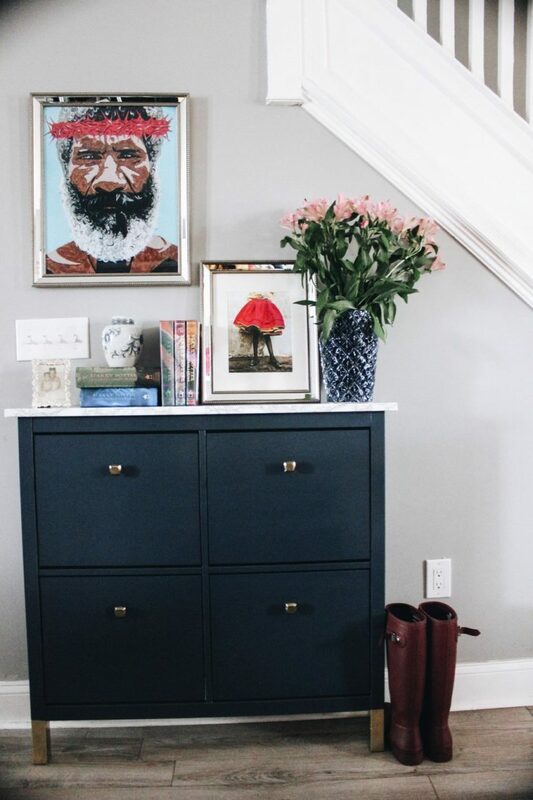 Assemble your cabinets, paint them powder blue leaving a wide trim out and add some contrasting knobs that make the cabinet matching for your entryway. Voila! 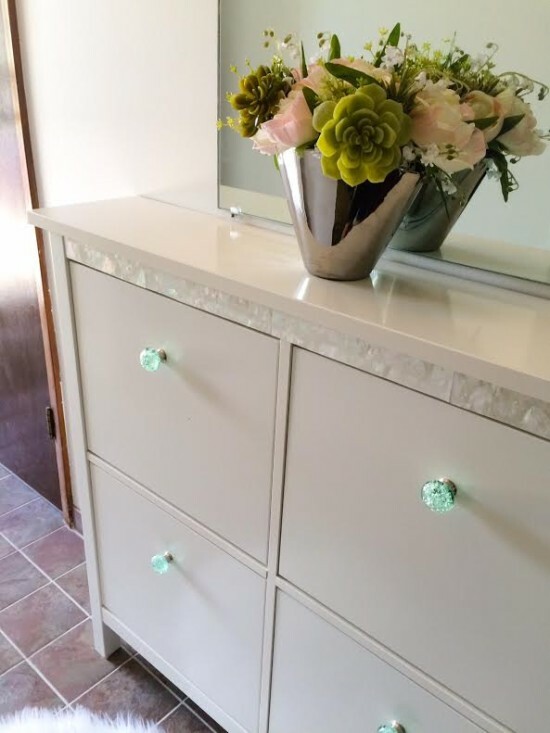 Add a touch of chic and gorgeousness to your simple IKEA piece with adhesive mother-of-pearl veneer and green bubble-glass knobs! The project requires no difficult hacking or repainting – just attaching some adhesive veneer and then knobs, which is fast. Enjoy your final result – it’s very elegant and chic. 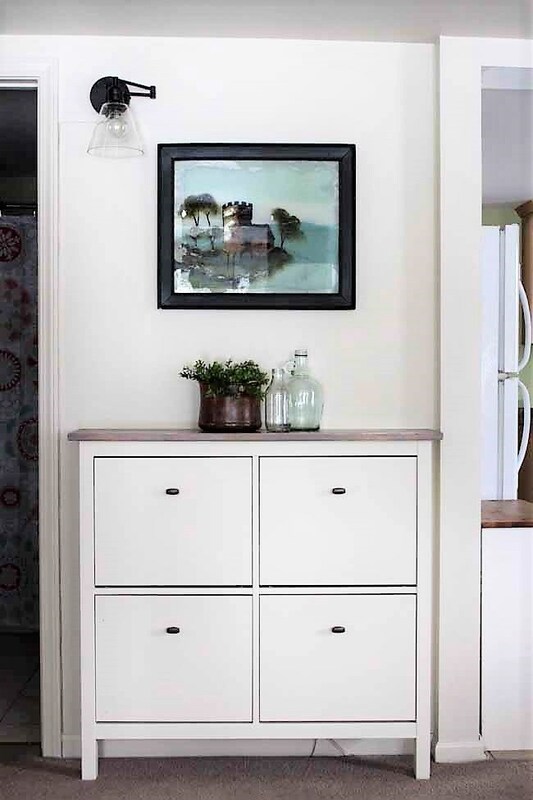 Make a gorgeous entryway console with additional shoe storage inside with this project. 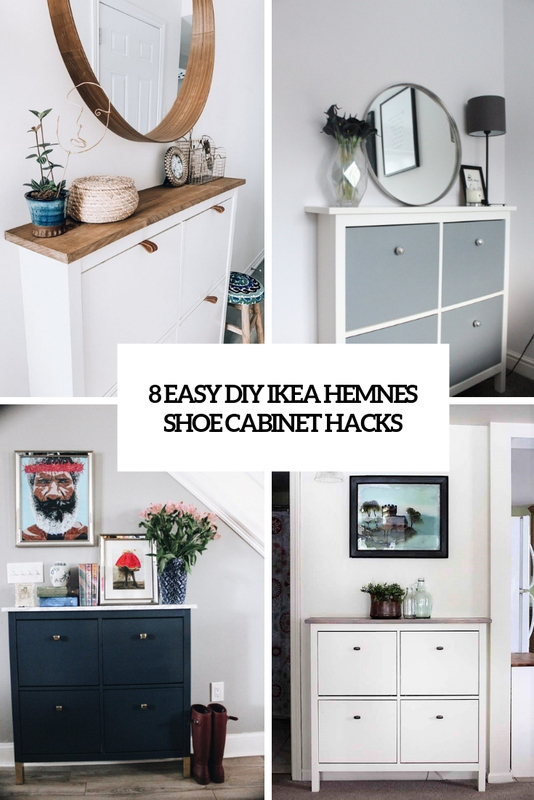 It will tell you how to make a double Hemnes shoe cabinet with a stylish wooden countertop. The cool thing is that you will get a storage space in the entryway and in the next space (kitchen, more likely), which is great. Enjoy your cool IKEA hack!